Specifications : Natural rubber, Styrene Butadine rubber, Nitrile rubber, Chlorene rubber, hypalon rubber, Butyl rubber, Styrene Butadine Rubber, Hypalon, Polyacrylic Rubber, Ethylene Propylene Diane Monomer, Silicone Rubber, Viton, Polyurethane, Carborylated Nitrile Rubber, Polybutadiene, PVC, Blended – NBR. 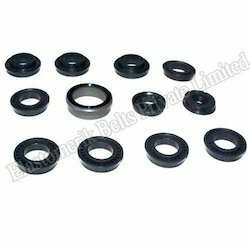 - We offer wide range of Rubber to Metal bonded parts manufactured with optimum quality rubber and metal. They are basically used for high pressure applications. We offer exclusive range of Rubber To Metal Bonded Products that are highly acclaimed for durability, flexibility and heavy duty performance. These rubber to metal bonded items are rigorously inspected on various parameters by our quality controllers, in order to provide defect free products to our respected worldwide clients. 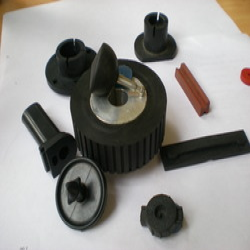 We are engaged in the manufacture and supply of specifically designed assortment of Metal Bonded Rubber Parts. Immensely used in the automobile industries, these products are highly acclaimed for their longer working life and reliable performance. For the manufacturing process, we make use of optimum quality rubber that is obtained from our reliable vendors.